Katherine Bateson-Chandler and Alcazar competing in the Grand Prix at the Adequan Global Dressage 1 CDIW in the Tota Comfort System Noseband. The Tota Comfort System, a patent pending, revolutionary bridle design, has been approved by the Fédération Équestre Internationale (FEI) for use in international competition. The design centers around a variation of the typical noseband and cheek piece structure, creating more stability in the jaw, a reduction of poll pressure, and alleviation of stress on the TMJ (temporomandibular joint) and facial nerves. Created and offered exclusively by The Dressage Connection, the combination of anatomical expertise and elite tack design is becoming the new standard for bridle comfort across disciplines. 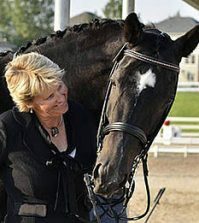 The catalyst for this revolutionary tack design was Canadian & US Olympians Ashley Holzer and Sue Blinks, who were seeking to improve unsteadiness in the bridle that hampered the connection between horse and rider as well as the horse’s overall performance. The unnecessary pressure applied by traditional bridles to the poll, facial nerves, and TMJ joint was detracting from her horse’s natural abilities, from those competing in the Grand Prix to the FEI Young Horse classes. 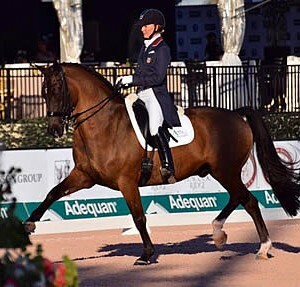 Holzer and Blinks brought their ideas on improving the traditional bridle structure to Charles Tota of The Dressage Connection, and together the three devised a curved cheek piece and stabilizing chin strap. Following trial and error tack fittings, Holzer debuted one of her mounts at Grand Prix with the bridle, and saw an immediate increase in her scores. Tota, with Ashley’s experience as inspiration, began trial and error tack fittings to perfect the design. The result is the Tota Comfort System, and with so many of Holzer’s horses competing at the international level, she believed having this bridle approved by the FEI would be a boon not only to their performance in the arena, but to the overall comfort of competing horses. After a few emails, phone calls, and a detailed explanation of the bridle’s design concepts, the FEI fully approved the Tota Comfort System. Visit the FEI’s website at http://fei.org/fei/disc/dressage/useful-docs, to see the Tota Comfort System’s approval note under Technical Documents.